Hopewell Township, New Jersey, U.S.
After midnight, a fingerprint expert examined the ransom note and ladder; no usable fingerprints or footprints were found, leading experts to conclude that the kidnapper(s) wore gloves and had some type of cloth on the soles of their shoes. No adult fingerprints were found in the baby's room, including in areas witnesses admitted to touching, such as the window, but the baby's fingerprints were found. Word of the kidnapping spread quickly. Hundreds of people converged on the estate, destroying the footprint evidence. Along with police, well-connected and well-intentioned people arrived at the Lindbergh estate. Military colonels offered their aid, although only one had law enforcement expertise—Herbert Norman Schwarzkopf, superintendent of the New Jersey State Police. The other colonels were Henry Skillman Breckinridge, a Wall Street lawyer; and William J. Donovan, a hero of the First World War who would later head the Office of Strategic Services (OSS). Lindbergh and these men speculated that the kidnapping was perpetrated by organized crime figures. They thought that the letter was written by someone who spoke German as his native language. At this time, Charles Lindbergh used his influence to control the direction of the investigation. They contacted Mickey Rosner, a Broadway hanger-on rumored to know mobsters. Rosner turned to two speakeasy owners, Salvatore "Salvy" Spitale and Irving Bitz, for aid. Lindbergh quickly endorsed the duo and appointed them his intermediaries to deal with the mob. Several organized crime figures – notably Al Capone, Willie Moretti, Joe Adonis, and Abner Zwillman – spoke from prison, offering to help return the baby in exchange for money or for legal favors. Specifically, Capone offered assistance in return for being released from prison under the pretense that his assistance would be more effective. This was quickly denied by the authorities. New Jersey State Police Superintendent Norman Schwarzkopf, Sr. The morning after the kidnapping, authorities notified President Herbert Hoover of the crime. At that time, kidnapping was classified as a state crime and the case did not seem to have any grounds for federal involvement. Attorney General William D. Mitchell met with Hoover and announced that the whole machinery of the Department of Justice would be set in motion to cooperate with the New Jersey authorities. The Bureau of Investigation (later the FBI) was authorized to investigate the case, while the United States Coast Guard, the U.S. Customs Service, the U.S. Immigration Service and the Washington, D.C. police were told their services might be required. New Jersey officials announced a $25,000 reward for the safe return of "Little Lindy". The Lindbergh family offered an additional $50,000 reward of their own. At this time, the total reward of US$75,000 (equivalent to $1,377,256 in 2018) was a tremendous sum of money, because the nation was in the midst of the Great Depression. 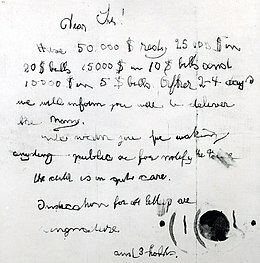 On March 6, a new ransom letter arrived by mail at the Lindbergh home. The letter was postmarked March 4 in Brooklyn, and it carried the perforated red and blue marks. The ransom had been raised to $70,000. A third ransom note postmarked from Brooklyn, and also including the secret marks, arrived in Breckinridge's mail. The note told the Lindberghs that John Condon should be the intermediary between the Lindberghs and the kidnapper(s), and requested notification via newspaper that the third note had been received. Instructions specified the size of the box the money should come in, and warned the family not to contact the police. During this time, John F. Condon — a well-known Bronx personality and retired school teacher — offered $1,000 if the kidnapper would turn the child over to a Catholic priest. Condon received a letter reportedly written by the kidnappers: It authorized Condon to be their intermediary with Lindbergh. Lindbergh accepted the letter as genuine. Following the kidnapper's latest instructions, Condon placed a classified ad in the New York American reading: "Money is Ready. Jafsie " Condon then waited for further instructions from the culprits. A meeting between "Jafsie" and a representative of the group that claimed to be the kidnappers was eventually scheduled for late one evening at Woodlawn Cemetery in the Bronx. According to Condon, the man sounded foreign but stayed in the shadows during the conversation, and Condon was thus unable to get a close look at his face. The man said his name was John, and he related his story: He was a "Scandinavian" sailor, part of a gang of three men and two women. The baby was being held on a boat, unharmed, but would be returned only for ransom. When Condon expressed doubt that "John" actually had the baby, he promised some proof: the kidnapper would soon return the baby's sleeping suit. The stranger asked Condon, "... would I 'burn'[a] if the package[b] were dead?" When questioned further, he assured Condon that the baby was alive. On March 16, Condon received a toddler's sleeping suit by mail, and a seventh ransom note. After Lindbergh identified the sleeping suit, Condon placed a new ad in the Home News: "Money is ready. No cops. No secret service. I come alone, like last time." On April 1 Condon received a letter saying it was time for the ransom to be delivered. The ransom was packaged in a wooden box that was custom-made in the hope that it could later be identified. The ransom money included a number of gold certificates – gold certificates which were about to be withdrawn from circulation, and it was hoped this would draw attention to anyone who was spending them. The bills were not marked but their serial numbers were recorded. Some sources credit this idea to Frank J. Wilson, others to Elmer Lincoln Irey. On April 2, Condon was given a note by an intermediary, an unknown cab driver. Condon met "John" and told him that they had been able to raise only $50,000. The man accepted the money and gave Condon a note saying that the child was in the care of two innocent women. On May 12, delivery truck driver William Allen pulled to the side of a road about 4.5 miles (7.2 km) south of the Lindbergh home near the hamlet of Mount Rose in neighboring Hopewell Township. When he went into a grove of trees to relieve himself, he discovered the body of a toddler. Allen notified the police, who took the body to a morgue in nearby Trenton, New Jersey. The skull was badly fractured and the body decomposed, having been chewed on by animals; there were indications of an attempt at a hasty burial. Gow identified the baby as the missing infant from the overlapping toes of the right foot and a shirt that she had made. It appeared the child had been killed by a blow to the head. Lindbergh insisted on cremation. In June 1932, officials began to suspect that the crime was an inside job that was perpetrated by someone the Lindberghs knew and trusted. Suspicion fell upon Violet Sharp, a British household servant at the Morrow home. She had given contradictory information regarding her whereabouts on the night of the kidnapping. It was reported that she appeared nervous and suspicious when questioned. She committed suicide on June 10, 1932, by ingesting a silver polish that contained potassium cyanide just before what would have been her fourth time being questioned. After her alibi was confirmed, it was later determined that the threat of losing her job and the intense questioning had driven her to kill herself. At the time, the police investigators were criticized for heavy-handed tactics. Following the death of Violet Sharp, John Condon was also questioned by police. Condon's home was searched but nothing was found that tied Condon to the crime. Charles Lindbergh stood by Condon during this time. After the discovery of the body, Condon remained unofficially involved in the case. To the public, he had become a suspect and in some circles was vilified. For the next two years, he visited police departments and pledged to find "Cemetery John." Condon's actions regarding the case were increasingly flamboyant. On one occasion, while riding a city bus, Condon claimed that he saw a suspect on the street and, announcing his secret identity, ordered the bus to stop. The startled driver complied and Condon darted from the bus, although his target eluded him. Condon's actions were also criticized as exploitative when he agreed to appear in a vaudeville act regarding the kidnapping. Liberty magazine published a serialized account of Condon's involvement in the Lindbergh kidnapping under the title "Jafsie Tells All". The investigators who were working on the case were soon at a standstill. There were no developments and little evidence of any sort, so police turned their attention to tracking the ransom payments. A pamphlet was prepared with the serial numbers on the ransom bills, and 250,000 copies were distributed to businesses, mainly in New York City. A few of the ransom bills appeared in scattered locations, some as far away as Chicago and Minneapolis, but those spending the bills were never found. Per a presidential order, all gold certificates were to be exchanged for other bills by May 1, 1933. A few days before the deadline, a man brought $2,980 to Manhattan bank for exchange; it was later realized the bills were from the ransom. He had given his name as J. J. Faulkner of 537 West 149th Street. No one named Faulkner lived at that address, and a Jane Faulkner who had lived there 20 years earlier denied involvement. Hauptmann was charged with capital murder, which meant that a conviction would result in the death penalty. The trial was held at the Hunterdon County Courthouse in Flemington, New Jersey, and was soon dubbed the "Trial of the Century". Reporters swarmed the town, and every hotel room was booked. Judge Thomas Whitaker Trenchard presided over the trial. A number of books have asserted Hauptmann's innocence, generally highlighting inadequate police work at the crime scene, Lindbergh's interference in the investigation, ineffectiveness of Hauptmann's counsel, and weaknesses in the witnesses and physical evidence. Ludovic Kennedy, in particular, questioned much of the evidence, such as the origin of the ladder and the testimony of many of the witnesses. According to author Lloyd Gardner, a fingerprint expert, Dr. Erastus Mead Hudson, applied the then-rare silver nitrate fingerprint process to the ladder, and did not find Hauptmann's fingerprints, even in places that the maker of the ladder must have touched. According to Gardner, officials refused to consider this expert's findings, and the ladder was then washed of all fingerprints. Today, the Lindbergh phenomena [sic] is a giant hoax perpetrated by people who are taking advantage of an uninformed and cynical public. Notwithstanding all of the books, TV programs, and legal suits, Hauptmann is as guilty today as he was in 1932 when he kidnapped and killed the son of Mr. and Mrs. Charles Lindbergh. Another book, Hauptmann's Ladder: A step-by-step analysis of the Lindbergh kidnapping by Richard T. Cahill Jr., concludes that Hauptmann was guilty but questions whether he should have been executed. According to John Reisinger in Master Detective, New Jersey detective Ellis Parker conducted an independent investigation in 1936 and obtained a signed confession from former Trenton attorney Paul Wendel, creating a sensation and resulting in a temporary stay of execution for Hauptmann. The case against Wendel collapsed, however, when he insisted his confession had been coerced. Several people have suggested that Charles Lindbergh was responsible for the kidnapping. In 2010, Jim Bahm's Beneath the Winter Sycamores implied that the baby was physically disabled and Lindbergh arranged the kidnapping as a way of secretly moving the baby to be raised in Germany. One theory is Lindbergh accidentally killed his son in a prank gone wrong. 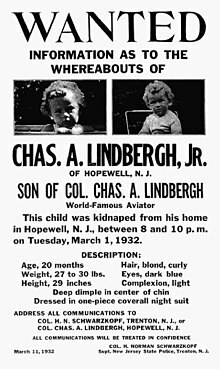 In Crime of the Century: The Lindbergh Kidnapping Hoax, criminal defense attorney Gregory Ahlgren posits Lindbergh climbed a ladder and brought his son out a window, but dropped the child, killing him, so hid the body in the woods, then covered up the crime by blaming Hauptmann. Robert Zorn's 2012 book Cemetery John proposes that Hauptmann was part of a conspiracy with two other German-born men, John and Walter Knoll. Zorn's father, economist Eugene Zorn, believed that as a teenager he had witnessed the conspiracy being discussed. 1934: Agatha Christie was inspired by circumstances of the case when she described the kidnapping of baby girl Daisy Armstrong in her Hercule Poirot novel Murder on the Orient Express. 1981: The kidnapping and its aftermath served as the inspiration for Maurice Sendak's book Outside Over There. 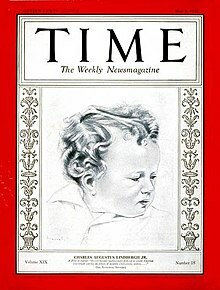 In the 2009 documentary Tell Them Anything You Want, Sendak says that he has been obsessed with the case of the Lindbergh baby since he was two years old. 2007: The novel Blaze by Stephen King (under his pseudonym Richard Bachman) is loosely based on the Lindbergh kidnapping. 2013: The Aviator's Wife by Melanie Benjamin is a work of historical fiction told from the perspective of Anne Morrow Lindbergh. 2016: Cold Morning: An Edna Ferber Mystery by Ed Ifkovic is a murder mystery centered around the trial. 1976: In the television movie The Lindbergh Kidnapping Case, Anthony Hopkins played the role of Bruno Hauptmann, while Cliff DeYoung played Charles Lindbergh and Sian Barbara Allen played Anne Morrow Lindbergh. 1996: The Lindbergh kidnapping was the subject of a 1996 Golden Globe- and Emmy-nominated TV movie titled Crime of the Century. Bruno Hauptmann was played by Stephen Rea and his wife Anna by Isabella Rossellini. 1999: In the Family Guy episode "Brian in Love", when Lois says it is time for Stewie to start potty training, Peter says, "You know what happened to the Lindbergh baby." This leads to a cutaway of Charles Jr. potty training and accidentally flushing himself down the toilet, much to the dismay of Charles and his wife, where they make the kidnapping up. Mrs. Lindbergh then says, "What about Amelia? She saw the whole thing," where it is revealed Amelia Earhart also witnessed it before Charles says, "You leave her to me," implying he was the cause of her disappearance. 2009: In the American Dad episode "Weiner of Our Discontent" Stan and Roger encounter a man living out of a storage unit adjacent to Roger's 'fortress of solitude' unit, who asks them, "Excuse me, gentlemen, if I just found out I'm the Lindbergh baby, whom do I tell?" 2010: In Fringe when Peter returns to the alternate universe from where he was kidnapped, his disappearance is said to have made international news. In response Peter says "So I'm the Lindberg Baby?" only to discover that no such kidnapping occurred in that universe. 2013: On July 31 the PBS program Nova aired "Who Killed Lindbergh's Baby? ", an investigation conducted by the former FBI forensics expert, John Douglas. Douglas explored the incident and trial of Hauptmann, then investigated various theories about who else was likely to have been an accomplice. 2016: In another episode of American Dad, "Fight and Flight" Stan tries to help Steve do a video project on Charles Lindbergh, which include several fictitious versions of events including the kidnapping. 2018: In an episode of "Saturday Night live", Kate McKinnon's character "Debette Goldry" said she was the babysitter of the baby, and she lost him when she had to go to an audition. 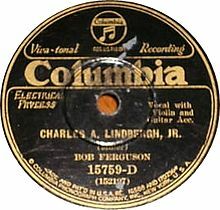 May 1932: Just one day after the Lindbergh baby was discovered murdered, the prolific country recording artist Bob Miller (under the pseudonym Bob Ferguson) recorded two songs for Columbia on May 13, 1932, commemorating the event. The songs were released on Columbia 15759-D with the titles "Charles A. Lindbergh, Jr." and "There's a New Star Up in Heaven (Baby Lindy Is Up There)". The musical Baby Case dramatizes the events of the Lindbergh trial and the media circus that surrounded it. William Cameron's full-length play, Violet Sharp, is based on the story of the young British maid working at the home of Anne Lindbergh's mother. Sharp's contradictory testimony about her whereabouts on the night of the crime raised the suspicions of the police investigators and of the public, though after she killed herself, it was found her alibi was indeed true and there was talk the police were being heavy-handed with their tactics. Ahlgren, Gregory; Monier, Stephen (1993). Crime of the Century: The Lindbergh kidnapping hoax. Branden Books. ISBN 0-8283-1971-5. Behn, Noel (1994). Lindbergh: The Crime. Atlantic Monthly Press. ISBN 0-8711-3544-2. Berg, A. Scott (1998). Lindbergh. G. P. Putnam's Sons. ISBN 0-3991-4449-8. Cahill, Richard T. Jr. (2014). Hauptmann's Ladder: A Step-by-Step Analysis of the Lindbergh Kidnapping. Kent State University Press. ISBN 978-1-60635-193-2. Cook, William A. (2014). The Lindbergh Baby Kidnapping. Sunbury Press. ISBN 1-6200-6339-5. Fisher, Jim (1994) . The Lindbergh Case. Rutgers University Press. ISBN 0-8135-2147-5. Fisher, Jim (2006). The Ghosts of Hopewell: Setting the Record Straight in the Lindbergh Case. Southern Illinois University Press. ISBN 978-0-8093-2717-1. Gardner, Lloyd C. (2004). The Case That Never Dies: The Lindbergh Kidnapping. Rutgers University Press. ISBN 0-813-53385-6. Kennedy, Sir Ludovic (1985). The Airman and the Carpenter: The Lindbergh Kidnapping and the Framing of Richard Hauptmann. Viking Press. ISBN 0-670-80606-4. Kurland, Michael (1994). A Gallery of Rogues: Portraits in True Crime. Prentice Hall General Reference. ISBN 0-671-85011-3. Melsky, Michael (2016). Of the Lindbergh Kidnapping. The Dark Corners. 1. Infinity Publishing. ISBN 978-1-4958-1042-8. Milton, Joyce (1993). Loss of Eden: A biography of Charles and Anne Morrow Lindbergh. HarperCollins. ISBN 0-0601-6503-0. Newton, Michael (2004). The Encyclopedia of Unsolved Crimes. Checkmark Books. ISBN 0-8160-4981-5. Norris, William (2007). A Talent to Deceive. SynergEbooks. ISBN 978-0-7443-1594-3. Reisinger, John (2006). Master Detective: Ellis Parker's independent investigation. Citadel Press. ISBN 978-0-8065-2750-5. Scaduto, Anthony (1976). Scapegoat: The Lonesome Death of Richard Hauptmann. G. P. Putnam's Sons. ISBN 0-3991-1660-5. Schrager, Adam J. (2013). The Sixteenth Rail: The evidence, the scientist, and the Lindbergh kidnapping. Fulcrum Publishing. ISBN 1-5559-1716-X. Zorn, Robert (2012). Cemetery John: The undiscovered mastermind of the Lindbergh kidnapping. Overlook Press. ISBN 1-5902-0856-0. "FBI files on the Lindbergh Kidnapping". "Lindbergh Kidnapping and other Top 25 Crimes of the Century". Time magazine. "Photographic Evidence from the trial". New Jersey State Archives. ^ a b c d e f g h i "The Lindbergh Kidnapping". FBI History – Famous Cases. Federal Bureau of Investigation. Archived from the original on 18 September 2010. Retrieved 25 June 2009. ^ Gill, Barbara (1981). "Lindbergh kidnapping rocked the world 50 years ago". The Hunterdon County Democrat. Retrieved 30 December 2008. So while the world's attention was focused on Hopewell, from which the first press dispatches emanated about the kidnapping, the Democrat made sure its readers knew that the new home of Col. Charles A. Lindbergh and Anne Morrow Lindbergh was in East Amwell Township, Hunterdon County. ^ a b Aiuto, Russell. "The Theft of the Eaglet". The Lindbergh Kidnapping. TruTv. Retrieved 24 June 2009. ^ a b "Lindbergh Kidnapping Index". Retrieved 16 October 2013. ^ a b c d e f g h i Linder, Douglas (2005). "The Trial of Richard "Bruno" Hauptmann: An Account". University of Missouri-Kansas City School of Law. Archived from the original on 9 July 2009. Retrieved 24 June 2009. ^ Newton, Michael (2012). The FBI Encyclopedia. North Carolina, USA: McFarland. p. 197. ISBN 978-0-7864-6620-7. ^ Bailey, Frankie Y.; Chermak, Steven (30 October 2007). Crimes and Trials of the Century [2 volumes]. ABC-CLIO. p. 167. ISBN 9781573569736. ^ Glass, Andrew (26 March 2007). "This Day on Capitol Hill: February 13". The Politico. Retrieved 24 June 2009. ^ Zorn, Robert (2012). Cemetery John: The Undiscovered Mastermind of the Lindbergh Kidnapping. The Overlook Press. p. 68. ISBN 9781590208564. ^ Fass, Paula S. (1997). "The nation's child ... is dead": The Lindbergh case. Kidnapped Child Abduction in America. New York, NY: Oxford University Press. p. 100. Retrieved 28 June 2009. ^ "Federal Aid In Hunt Ordered By Hoover". The New York Times. 3 March 1932. Retrieved 18 December 2016. ^ Aiuto, Russell. "Parallel Threads, Continued". The Lindbergh Kidnapping. TruTv. Retrieved 27 June 2009. ^ Note: "Jafsie" was a pseudonym based on a phonetic pronunciation of Condon's initials, "J.F.C." ^ Maeder, Jay (23 September 1999). "Half Dream Jafsie". Daily News. Archived from the original on 10 July 2009. Retrieved 27 June 2009. ^ a b c d e f Manning, Lona (4 March 2007). "The Lindbergh Baby Kidnapping". Crime Magazine. Retrieved 24 June 2009. ^ Eig, Jonathan (2010). Get Capone: The secret plot that captured America's most wanted gangster. Simon and Schuster. p. 372. ISBN 9781439199893. ^ Folsom, Robert G. (2010). The Money Trail: How Elmer Irey and his T-men brought down America's criminal elite. Potomac Books. pp. 217–219. ^ a b "Crime: Never-to-be-Forgotten". Time. 23 May 1932. Retrieved 28 June 2009. ^ "Murdered child's body now reduced to pile of ashes". The Evening Independent. 14 May 1932. ^ "Morrow Maid balks inquiry". www.lindberghkidnappinghoax.com. 10 June 1932. ^ Falzini, Mark W. (April 2006). "Studying the Lindbergh Case – A Guide to the Files and Resources Available at the New Jersey State Police Museum" (PDF). Violet Sharp collection. The New Jersey State Police. p. 20. Archived from the original (PDF) on 19 February 2010. Retrieved 28 June 2009. ^ "The Lindbergh Kidnapping". UK: The Biography Channel. Archived from the original on 10 July 2009. Retrieved 28 June 2009. ^ "The Lindbergh Kidnapping". The Biography Channel UK. Archived from the original on 10 July 2009. Retrieved 28 June 2009. ^ "Lindbergh Baby Booty". New York Press. 11 March 2003. Retrieved 28 June 2009. ^ "Ministers protest billing of Condon; 25 see Jafsie Vaudeville Act scheduled for Plainfield as tragic exploitation". The New York Times. 5 January 1936. Retrieved 28 June 2009. ^ "Milestones Jan. 15, 1945". Time Magazine. 15 January 1945. Retrieved 28 June 2009. ^ Woolley, John; Peters, Gerhard. "Executive Order 6102 – Requiring Gold Coin, Gold Bullion and Gold Certificates to be Delivered to the Government April 5, 1933". The American Presidency Project. Retrieved 24 June 2009. ^ "National Affairs: 4U-13-41". Time Magazine. 1 October 1934. Retrieved 28 June 2009. ^ "National Affairs Oct. 8, 1934". Time Magazine. 8 October 1934. Retrieved 28 June 2009. ^ "The Kidnapping". PBS. Archived from the original on 26 September 2011. Retrieved 29 September 2011. ^ a b Fisher, Jim (1 September 1994). The Lindbergh Case. Rutgers University Press. ISBN 978-0-8135-2147-3. ^ "'Trial of the Century' over Lindbergh baby murder commemorated in new portraits". Retrieved 26 February 2018. ^ Gardner, Lloyd C. (June 2004). The Case That Never Dies. Rutgers University Press. p. 336. ISBN 978-0-8135-3385-8. ^ Schrager, Adam (2013). The Sixteenth Rail: The Evidence, the Scientist, and the Lindbergh Kidnapping. Fulcrum Publishing. ISBN 978-1-55591-716-6. ^ Ross, Amanda T. (31 March 2009). "CSI Madison, Wisconsin: Wooden Witness". Forest History Society. ^ James, Bill (2011). "[no title cited]". Popular Crime. pp. 147–161. ^ "Hoffman seeks reprieve advice". The Daily Princetonian. Princeton University Library. March 28, 1936. ^ Blackman, Samuel G. (31 March 1936). "Pardons court again denies Hauptmann plea and governor declares "No reprieve"". The Titusville Herald. ^ Porter, Russell B. (1 April 1936). "Hauptmann gets a stay for at least 48 hours at grand jury request". The New York Times. ^ Gardner, Lloyd G. (2004). "The case that never dies". p. 344. ^ Fisher, Jim. "Biography". Retrieved April 29, 2011. ^ Fisher, Jim (1994) . The Lindbergh Case. Rutgers University Press. p. 480. ISBN 0-8135-2147-5. ^ Fisher, Jim (1999). The Ghosts of Hopewell: Setting the Record Straight in the Lindbergh Case. Southern Illinois Univ Press. p. 224. ISBN 0-8093-2285-4. ^ Fisher, Jim. "The Lindbergh Case: A Look Back to the Future". p. 3. Retrieved 29 April 2011. For the Lindbergh case, the revisionist movement began in 1976 with the publication of a book by a tabloid reporter named Anthony Scaduto. In Scapegoat, Scaduto asserts that the Lindbergh baby was not murdered and that Hauptmann was the victim of a mass conspiracy of prosecution, perjury, and fabricated physical evidence. ^ Fisher, Jim. "The Lindbergh Case: How can such a guilty kidnapper be so innocent?". p. 3. Retrieved April 29, 2011. ^ "Master Detective – Americas Real-life Sherlock". ^ Bahm, Jim. "Beneath winter sycamores". ^ Colimore, Edward (8 July 2012). "Tale of a Lindbergh conspiracy draws attention". The Inquirer. Retrieved 19 August 2012. ^ Jim Fisher (1 September 1994). The Lindbergh Case: A Story of Two Lives. Rutgers University Press. p. 249. ISBN 9780813521473. ^ a b Haase, Donald, ed. (1996). The Reception of Grimms' Fairy Tales: Responses, reactions, revisions. Wayne State University Press. p. 209. ISBN 9780814322086. In it, I am the Lindbergh baby. ^ Rich, Katey. "Stephen Root will play a wood expert in Clint Eastwood's J. Edgar". Cinema Blend. Retrieved 26 February 2011. ^ "Who killed Lindbergh's baby?". Nova. 31 July 2013. PBS/WGBH, Boston. Retrieved 2 August 2013. ^ "The Biography Channel – The Lindbergh Kidnapping Biography". 10 July 2009. Retrieved 26 February 2018. ^ French, Samuel. "Violet Sharp". Retrieved 8 November 2016.